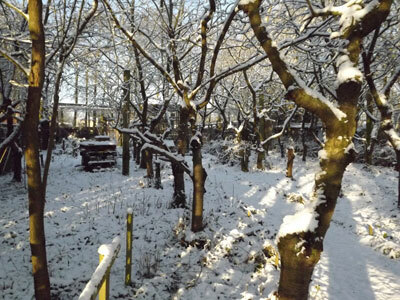 The snow has returned to us here at the Suffolk Owl Sanctuary with a vengeance - so much so it is pretty astonishing to think that just a week ago we were all working outside in short sleeves with the temperatures into double figures. The freezing temperatures have certainly made the Sanctuary look very scenic and thankfully all of our owls and other birds of prey are coping with the weather pretty well thanks to the cover & warmth provided by their downy plumage. Some, like Loki our Snowy Owl who naturally can survive in temperatures as low as minus 40°C, are positively thriving on the acetic conditions. Others of our winged friends are not quite so well prepared for conditions that freeze the found and water surfaces. As you will be aware we have a very healthy population of songbirds here in our Woodland Walk and during this cold snap, it has been very important to keep the seed feeders, fat ball and peanut dispensers topped up so they keep well fed and healthy. If you're doing the same at home, please don't forget to put out fresh water daily so the birds can have a drink - a requirement equally as important as being able to feed.